We are a dedicated team who are passionate about what we do. Find out more about us, where we’ve come from and what we do at Future First. Matt joined Future First as Chief Executive Officer in January 2018. Previously Matt was Director of Partnerships and Policy at UK Youth, leading on cross-sector partnerships, income generation, impact management and national policy. He has worked in the education and voluntary sectors for 25 years, and since 2004 in charity leadership; as Director of Operations at School Councils UK - a national education charity specialising in youth participation and active citizenship in schools, and more recently leading on the delivery of the successful Social Impact Bond funded, education-to-employment initiative, ThinkForward. Matt also founded the social enterprise, Treetop Training and Education, providing a range of consultancy, training, professional development and project management services to the education and youth sectors. Beth joined Future First in January 2017 to work with schools and colleges across the North and Midlands and to lead a team of Alumni Programme Officers. In September 2018, she took on the role of Director of Programmes at Future First. Beth has a background in education, having worked in schools in Sussex, Surrey and Greater Manchester for 10 years as both an English teacher and department lead. She has also worked as a team leader for a national examination board and volunteered as a mentor for young people with a social justice charity. Beth has an MA in English Language from the University of Lancaster, a PGCE from the University of Brighton and a degree in English Literature from the University of Sheffield. Laura joined Future First in August 2015 to work with schools and colleges across London and the South West and lead a team of Alumni Programme Officers. In 2017, Laura moved into Future First\\\'s operations team as Head of Digital, working with the tech team on the development of the alumni portal to ensure it meets user needs. In 2019, Laura became Director of Operations and Finance. Prior to joining Future First, she worked for an education trade body in various roles, from finance and HR through to marketing and events. She has a Master’s in Education, Gender and International Development from the Institute of Education and a BA in French and Linguistics from the University of Manchester. Alex joined Future First as Head of Partnerships & Development in June 2018 to increase the impact of Future First’s collaborations with corporate partners. Alex has a background in education, working in schools as Head of Department for Philosophy & Religious Studies in London and Hong Kong. Before joining Future First, Alex co-managed a social-enterprise which facilitates sustainable development projects for ethnic-minority communities in South East-Asia, partnering with schools and student volunteers from all around the world. Alex has a PGCE in Religious Studies from Oxford University and has recently completed a Masters Degree in Education & Leadership at University College London. Alex joined Future First in 2018 as an Alumni Programme Officer for the North and Central team. Alex studied Combined Arts at Durham University before going on to gain a PGCE at the University of Manchester. Over the years, Alex has worked in schools throughout the Greater Manchester area, initially as a Teaching Assistant with a focus on Special Educational Needs and then later as a Primary School Teacher. More recently Alex has worked as a Customer Services Team Leader for Dogs Trust Manchester where she specialised in customer relations as well as the implementation and delivery of volunteer and staff training. Alex is passionate about the benefits of building alumni communities in state schools and colleges and strives to raise aspiration through her role as Alumni Programme Officer. Amy joined Future First in February 2017 as an Alumni Programme Officer and now leads our work with primary schools to ensure all young people have access to relatable role models. Prior to this, Amy worked as a Primary school teacher in the London Borough of Bexley. She gained her PGCE from the UCL Institute of Education as part of the Teach First Leadership Development Programme. Amy is committed to empowering young people to achieve fulfilling futures. She continues to volunteer her time to youth based organisations that support the educational and personal success of young people, both in the UK and abroad. Amy also has a first class honours degree in Geography from the University of Exeter. Andy joined Future First in 2016 to coordinate projects run in partnership with our employer partners. Andy previously worked for a school governor recruitment charity where his passion for improving the lives of young people grew. Cath joined Future First as Head of Marketing & Communications in June 2018 to develop Future First’s strategic marketing plans. She joins from education charity Ambition School Leadership where she led national marketing campaigns building a network of exceptional school leaders to transform the lives of children who need it the most. Cath has a background in marketing and education, having worked on award winning campaigns for the Department of Education, Salford University and Manchester Business School. She also worked developing community relationships and volunteering projects for young people at the University of Manchester. Cath has a CIM Professional Diploma in Marketing and a BA in English Literature from Cardiff University. Charlie joined Future First in October 2018 to work with schools and colleges across the North and Midlands and to lead a team of Alumni Programme Officers in this region. Having taught English for three years as part of the Teach First Leadership Development Programme, Charlie developed an interest in social mobility and widening participation. Before joining Future First, Charlie worked at The Brilliant Club developing their teacher training and widening access programmes and has also worked with The Girls’ Network delivering mentoring programmes and encouraging employer engagement in education. Charlie has a degree in History and Politics from Lancaster University. Before joining Future First Charlotte developed her interest in issues concerning social mobility, earning a first class degree in Sociology from the University of Warwick. From there, her work as an Engagement Coordinator promoting apprenticeships in schools, along with her employment by the Deliberately Developmental Organisation Next Jump in 2017; led her to realize her passion for helping others grow and catalysed her decision to begin to train as a Personal Performance Coach. Charlotte\'s passion for working with young people was further developed by her role as a Community Connector, recruiting and engaging volunteers for a local charity in Barnet. She currently volunteers as a Mentor for youth charity Safer London. Chris joined Future First in 2018 to work with schools and colleges across the South West to create inspiring alumni networks. Chris has 15 years’ experience in education and is passionate about great education opportunities for all. He was a volunteer in a teacher training college in Inner Mongolia with VSO, and a supporter of The Library Project – donating books and libraries to underfunded schools in South East Asia. He was previously Vice-President of Aston Educational Group where he led international programs linking US High Schools and Edu-tech companies with schools in China and Vietnam. He has a degree in International Business and Japanese from Liverpool. Daniel has a BA in English and a Masters Degree in Comparative Literature, both from Goldsmiths College. His dissertation focused on queer history, culture and art, and he took his research into his voluntary work with the Good Lad Initiative, who work with groups of boys in schools to engage in conversations around gender inequality, and the negative impact of gender stereotypes and hierarchies in society. As a volunteer he seeks to inspire young people to make changes for the better, and he joined Future First to continue working with schools and communities to inspire and empower young people. Dave joined the team in April 2014 as a Developer. He works on all aspects of Future First’s tech offering, particularly Meteor and Salesforce, preferring ‘back-end’ aspects such as database work. He has previously worked in IT support and IT recycling/refurbishment, and has volunteered for a charity which sends refurbished computers to schools and community projects in Africa. In his spare time, David designs, builds and programs small computers based on 1980s-era processors. Davy joined Future First as an Alumni Programme Officer in August 2018. With a background in fashion, IT and various youth education charities, Davy is passionate about raising aspirations and empowering young people to believe in themselves and have a brighter future. Most recently, Davy worked for ReachOut, training mentors for young people from disadvantaged backgrounds and delivering inspirational workshops with businesses across Greater Manchester. Davy has a degree in Psychology from the University of Birmingham. Before joining Future First, Edina was a Projects Assistant at vInspired, having gained a passion for volunteering at a number of community groups. She volunteers annually at a night shelter. Edina studied Politics at Queen Mary University of London. After initially going to work for a corporate company, Edina realised that she wanted to work in the not for profit sector. Since then she has worked in the House of Commons before going on to work in the charity sector. Ellie graduated in 2015 with a degree in History and spent a year working at the University of Edinburgh and Edinburgh Medical School in finance and welfare. She then went to Suzhou, China for two years; first with the British Council and then at Suzhou International Foreign Language School where she taught English, History and some PE. 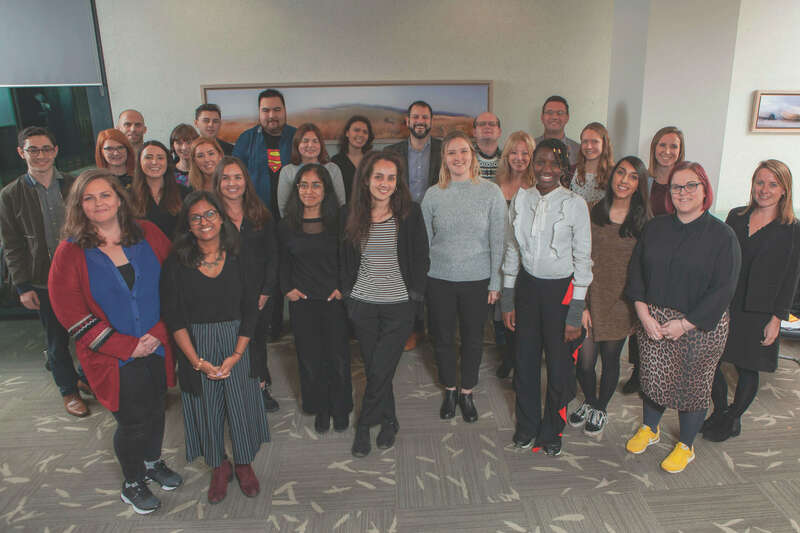 Since coming home in June 2018 she found her first role in the charity sector at Ambition School Leadership, where she was a Programme Delivery Associate for the Middle Leadership Programme. Before joining Future First in 2018, Emily tutored English to pupils from underprivileged backgrounds, in order to prepare them for their GCSEs, and volunteered at Refugee Action Kingston\\\'s homework club. She is committed to ensuring pupils from all walks of life have equal educational opportunities. Emily has a master\\\'s degree in Romantic and Victorian Literature from Durham University and a degree in English Literature from the University of York. Before joining Future First, Emily completed a degree in Russian, Ukrainian and German at the University of Cambridge. In 2017, she worked for an NGO in Siberia where she led workshops in intercultural dialogue and gave presentations about British culture, as well as organising international exchange programmes and teaching language classes at local schools and universities. Emily has also taught English to young people in Germany and Ukraine and is looking forward to working with students and teachers from a range of different schools as an Alumni Programme Officer. Harry joined Future First in 2017 to assist the alumni department. Harry left Sixth Form in 2015 to go travelling. He returned with the determination to help improve the lives of young people after the experiences he encountered. Josh joined Future First in September 2018 to assist with the Executive Board and Communications Team. After graduating with a degree in English Language he began working in B2B Marketing and Communications before taking a year out to travel the world. Once he returned from his travels Josh knew that the charity sector was where he belonged. Joy joined Future First in January 2017 to work with schools and colleges across the South East and lead a team of Alumni Programme officers in this region. Joy has a background in volunteer recruitment and management. She has previously worked for Raleigh International, recruiting young people for overseas voluntary programmes, as well as Oxfam where she managed a team of volunteers organising events for the national Oxjam Music Festival. She spent most of 2016 working abroad with the YMCA, which developed her interest in working with young people from various backgrounds. Joy has a degree in Geography from the University of Bristol. Katy joined Future First in 2018 as an Alumni Programme Officer for the North and Central team. Katy has experience working in different positions within schools, either in an administrative capacity, as a classroom assistant or by providing one-on-one support. Specifically, Katy\\\'s work has been in assisting pupils with Special Educational Needs. More recently, Katy has been a volunteer EFL teacher to refugees through the charity Student Action for Refugees\\\' (STAR). Katy graduated from the University of Manchester in 2018 with a degree in Politics and International Relations. She joins Future First with a passion for reducing educational inequality in the U.K., and a specialist interest both in raising the aspirations and encouraging the involvement of young people unrepresented by and disillusioned with Parliament. Lauren graduated from St Catharine\\\'s College, Cambridge, with a degree in English in 2018. While at university, she was involved in a range of volunteering opportunities, which convinced her she wanted to work in the third sector after graduation. Before joining Future First in 2019, Lauren worked in the Partnerships team at the United World Schools charity, who provide access to education in remote communities in South East Asia. After this, she was keen to return her attention to combating educational inequality for young people here in the U.K.
Lucy joined Future First in 2016 as an Alumni Programme Officer to work with schools across Cornwall Devon and Somerset. Prior to this, she worked for a charity that supports and advises single parent families. As a Programme Lead, she provided delivery and development of projects to support single parents in building the skills and confidence needed to return to work, training or education. Lucy draws on her own experiences of growing up in the South West to strive to improve social mobility in the area and is committed to delivering projects that support young people to improve their confidence motivation and skills. Lucy has a degree in Contemporary Performing Arts from the University of Central Lancashire where she first worked on youth community projects. Naomi studied Religion, Philosophy and Ethics at King’s College London before gaining a PGCE at the University of Exeter and teaching on the Isle of Wight. As a member of the Teach First Leadership Development Programme she particularly focused on supporting students from lower socio-economic backgrounds and is passionate about improving the life outcomes of young people. Most recently she has completed an MA in Sociology at the University of Warwick, including a dissertation on the impact of the Fundamental British Values policy in schools. Before joining Future First in 2018 Natalie was living in Australia working at a variety of arts festivals. She gained experience managing and developing volunteer programmes. She has previously worked as a Science Communicator, leading workshops in Scotland and the U.A.E. Natalie would both train and deliver workshops to young people aged 5 – 16 years. She recently toured a chemistry workshop across Scotland which further developed her interest in informal learning programmes. Natalie has a degree in History from the University of Edinburgh. Natalie joined Future First in April 2019 as Head of Innovation and Learning. As part of this role Natalie is responsible for developing and implementing innovative and high impact projects, as well as leading on impact measurement and the dissemination of what works. Prior to this, Natalie worked at Brightside, an online mentoring charity where she managed a large portfolio of mentoring projects working in partnership with universities and higher education providers across the UK. She also worked for a number of years at the charity Become, leading on the development of Propel, a project inspiring care leavers to access higher and further education. As well as a background working with schools and the education sector, Natalie has considerable experience in impact measurement and the implementation of systems and processes to ensure effective data capture. Natalie has a first class honours degree in Modern History and Politics from the University of Southampton. Pascale joined FutureFirst in April 2019 to work as an Operations Officer. She has a background in education, originally teaching English in secondary schools, and running after-school English clubs to children aged 5-11, then teaching French in further education and in universities in London and getting involved with course development, staff training and Education Technology along the way. Pascale has an MA in English literature and civilisation from the Universite Lyon III, France, and is a qualified teacher of French for Adults. Raiesa joined Future First in 2018 as an Alumni Programme Officer before becoming a Regional Lead with a team working across the South East. Raiesa has worked in the charity sector over the past five years, beginning her roots as an intern for a sustainability & human rights charity. After volunteering abroad in Cambodia, Raiesa joined an education charity and has been working with young people ever since, facilitating workshops and collaborating with schools with the aim of providing positive, ambitious outlooks for their students. Outside of work, Raiesa has run her own funded project, leading a team in designing and facilitating a series of creative workshops for young refugees in London. She has a BEng in Civil with Environmental Engineering from the University of Brighton. Sue joined Future First in spring 2012 as our Press and Publicity Officer. Sue has significant experience in print and TV. She’s worked in front of the camera and behind the scenes, newsreading, reporting on and presenting half hour documentaries on social, economic and political issues in Britain and abroad for broadcasters including BBC and ITV. Through bringing up three daughters, Sue’s helped with literacy in schools and developed an interest in education, specifically special needs and children in care. She’s written for The Daily Mail, Daily Express, Sunday Telegraph and Observer. She has a BA in Communication Arts and Media from Leeds University. As Chair, Christine leads the Future First board and supports the senior leadership team to ensure Future First has maximum impact on schools and colleges across the country. Christine is probably best known for her role as Her Majesty’s Chief Inspector at Ofsted. However, she has also been a teacher, headteacher, director of education and local authority chief executive. Christine received a CBE in 2006 for services to education and local government. Deji is the Executive Director at J.P. Morgan, working on the European Loan Trading desk. A supporter of Future First since he joined the alumni network at in his old school in 2008, Deji joined the board in 2010. Deji is the founder of a mentoring programme between J.P. Morgan and South Camden Community School, encouraging City workers to engage with and support young people at the school. He has a degree from Oxford University in Economics and Management. Michael’s background is managing and investing in global education services (careers information, international schools and colleges) and risk based information software businesses. He is actively involved in the commercialisation of University technologies. He chairs the Commercial Board at the University of Liverpool and manages two spin out companies at City University London. Prior to this he was CEO of an investment group investing in education and CEO of one of the UK’s most successful University spin outs (UCL). Michael has an MSc and Sloan Fellowship from London Business School. Sally is Chief People Office at Fidelity International (FIL) with responsibility for global human resources and corporate affairs. She has been with the firm for 19 years. Prior to this, Sally worked at PwC in Human Resources for 12 years. Sally is a member of the Chartered Institute of Personnel Development and is also a qualified secondary school teacher of English language and literature. Amy Finch is Head of Learning and Impact at Spirit of 2012, a Big Lottery devolved trust that funds projects across the UK. She is particularly interested well-being, connectedness and social capital. Amy was a staff member at Future First between 2013-2016. She applied to be a Trustee in 2018 because she believes the organisation offers a rare opportunity to level the playing field by delivering system-wide change. Amy is a former History teacher and has previously served as a Vice-chair of governors and Girl Guide leader. Victoria grew up in the North East of England and attended local state schools before studying at Durham University. She is currently Head of Development & External Relations at St Cross College, University of Oxford, where she leads a global alumni engagement programme. Prior to relocating to Oxford she was Vice Principal of Collingwood College, Durham University, and had responsibility for enhancing the student experience. Victoria is an experienced school governor, having served as both Chair and currently Vice Chair at Primary Schools in Oxfordshire, and she has sat on the Advisory Boards of two student-led community engagement organisations. Victoria is an active alumni volunteer for her alma mater, and believes passionately in the support alumni can offer to young people. Alex was Managing Director at Future First from September 2011 for five years. Under Alex’s leadership Future First grew from working with 14 schools to more than 10% of all secondaries nationwide. Alex also led Future First to gain its first place in the government’s best practice guide for careers education. Based on his achievements at Future First, Alex was awarded the Skoll Scholarship at the University of Oxford, Said Business School, enabling him to undertake an MBA. Following this, Alex joined the children’s mental health charity, Place2Be. There he leads the work with all partner schools (managing over 350 clinicians! ), oversees the research and evaluation team and has responsibility for growing the organisation’s income from commissioning. Prior to his role at Future First, Alex was Head of Maths at The Petchey Academy, Hackney and Head of Year 9 and 10 at London Academy, Edgware. He holds a first class degree in Politics, Philosophy and Economics from the University of Warwick. During her time at Future First First Anna was promoted from Alumni Officer to Senior Communications and Policy Officer. In her role she told Future First’s stories to the public, policy makers, schools and young people. Anna led an organisation- wide rebrand to modernise the charity, developing brand guidelines and a new website. Anna is now Advocacy and Campaigns Manager at Lumos, an international children’s charity founded by J.K. Rowling to end the institutionalisation of children around the world. She leads Lumos’ political and public campaigns. Anna’s role involves working with the UN, civil society and national governments to ensure their policies and funding supports children to grow up in loving families, rather than in orphanages. She recently gave evidence about children living in orphanages and other institutions at the United Nations in Geneva. Prior to her role at Future First, Anna was Advocacy and Network Development Assistant at the Consortium for Street Children. Anna studied Politics and International Development at the University of Glasgow before doing a Masters in International Child Studies at King’s College London, in which she spent time in South Africa doing research with young girls living on the streets. During her time at Future First Debbie was promoted from Programme Officer to Director of Programmes in which she managed the school/college-facing team to support partners with establishing alumni communities and facilitate events. Debbie ran Future First’s first ever Back to School Week. The i Newspaper reported on events each day and Debbie delivered events across eight cities, working with over 1000 young people in the process. Debbie is now Director of Real World Learning and Partnerships at School 21, a pioneering 4-18 free school in East London. Debbie manages the many hundreds of relationships that the school has with organisations and individuals and sits on the senior leadership team, playing a key role in shaping the school’s vision and strategy. Before joining the Future First team, Debbie worked in a secondary school in North London for six years, first as a teaching assistant and then as a psychology teacher. Fiona was a Programme Officer at Future First, delivering quality career focused events. Whilst at Future First, Fiona helped to increase the number of events delivered in Yorkshire and the North of England, helping to grow our geographical reach. Fiona is now working with young people to provide accurate and impartial information to encourage progression into higher education at the Higher Education Progression Partnership. She also has a keen interest in writing and has had several articles published on websites and in the local newspaper. Prior to joining Future First, Fiona studied Drama at University and had worked on multiple community youth projects such as the National Citizen Service. Whilst at Future First, Petrina led the development and launch of ‘Co-Teaching in the Classroom’, a resource for teachers on how to use alumni in the classroom to link the curriculum to the world of work. ‘Co-Teaching in the Classroom’ has become a core strand of Future First’s work, and Petrina now delivers teacher CPD sessions on the topic on a freelance basis. Petrina currently teaches English at a school in East London and is a trustee of the Shakespeare Schools Foundation, a cultural education charity. Petrina was inspired to re-train as a teacher following her experience of working in a number of youth-focused roles for notable organisations as well as Future First including The Young Foundation, UpRising and the Foreign and Commonwealth Office. Petrina holds a degree in English Literature from the University of Reading. Whilst at Future First Daniel was promoted from Programme Officer to Project Manager – Employer Partnerships, in which he managed one of our biggest employer partnerships and facilitated events in schools across the country. Daniel is now Senior Enterprise Coordinator at the Greater London Authority. He works with schools across East London to build a network of business volunteers that can support schools to develop an effective careers and enterprise strategy and increase employer encounters. Prior to joining Future First Daniel taught Maths and Statistics at an East London Girls’ school as part of the Teach First Programme. Daniel has a degree in Philosophy, Politics and Economics from the University of York. Whilst at Future Fist Amy was promoted from Senior Programme Officer to Head of Innovation and Development. She worked with corporate partners to run, design and deliver employability sessions with young people. Amy successfully established one of Future First’s biggest employer partnerships, helped to design our first teacher training sessions and led on the production of Future First’s Digital Toolkit. Amy is now Head of Learning and Impact at Spirit of 2012, a charitable trust that funds projects that improve wellbeing and social cohesion by supporting people be more active, creative and connected. Amy supports projects such as the Hull 2017 City of Culture and Women of the World festivals to understand and evaluate their impact. Before joining Future First, Amy spent three years teaching History and worked as a researcher at the BBC in Operations, Policy & Strategy. Whilst at Future First Jess was promoted from Alumni Assistant to the role of Communications Officer, in which she took a leading role in the development and implementation of our communications strategy. Jess is now Communications Officer at Camden Council. She delivers campaigns across the council and develops strategic communications plans. Jess has a first class honours degree in Journalism from City University London. Whilst at Future First, Shanade lead the In-House Project, where she was a part-time member of staff at six schools in the South East. One of her biggest achievements was planning and delivering 17 workshops in one school in just 7 weeks. Shanade is now the Student Network Manager for Elevation Networks, a youth employment charity. Shanade works with university students across the country, delivering various campaigns and events for employers across the academic year. She is also coordinates the Student Leadership Development Programme for 12 university students passionate about social action. Prior to joining Future First, Shanade taught English at a school in North London following the completion of her PGCE at UCL Institute of Education. Shanade has a degree in English Literature and Media Studies from De Montfort University.